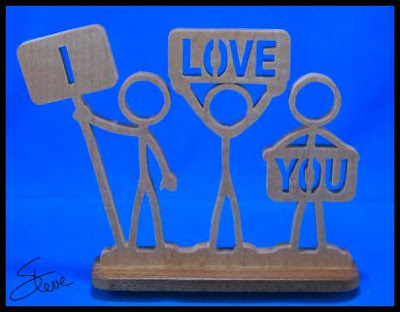 Stickman "I love you" Scroll Saw Pattern. So, you have cut several of my Stickman series of patterns. Your significant other is starting to be concerned that maybe you are regressing back into your childhood or even worse slipping into early signs of senility. Before he or she starts making arrangement to keep you safe from yourself, make this little project and gift it to them. It may not stop the men in white coats from showing up but at least your loved one will feel guilty for calling them. 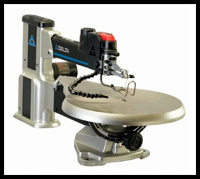 Pegas Scroll Saw Clamp Heads for the DeWalt DW-788 and Delta 40-694 scroll saws: Pre-Order Now from Bear Woods. 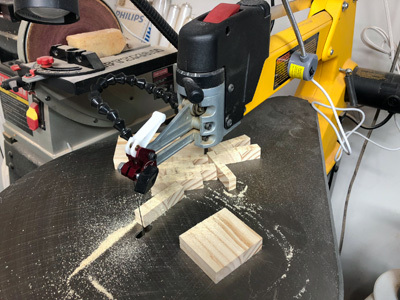 Back in January of this year, I reviewed the new Pegas clamp heads for the Excalibur style scroll saws. At that time I showed that the clamps could also be installed on the DeWalt and Jet scroll saws even though they were not specifically designed to do so. 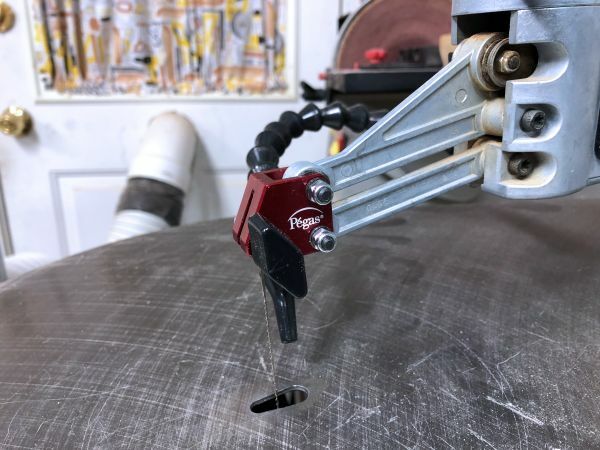 I also mentioned to Pegas at that time that it would be nice if they would develop these clamps specifically for the DeWalt and the Jet. They are a company that listens to their customers so they got to work and now DeWalt and Jet saw owners have this new accessory. I will review the Jet version later this week. It deserves its own write-up. If you are not familiar with this product let me give you some background. Pegas makes scroll saw blades. They are experts in what makes a scroll saw blade efficient. I personally think they make one of the finest blades on the market. Because of this expertise, they decided to see if they could make a better clamp to hold the blade. That's the process that this product came from. They say this clamp is designed to improve the vibration of the machine by reducing the weight. 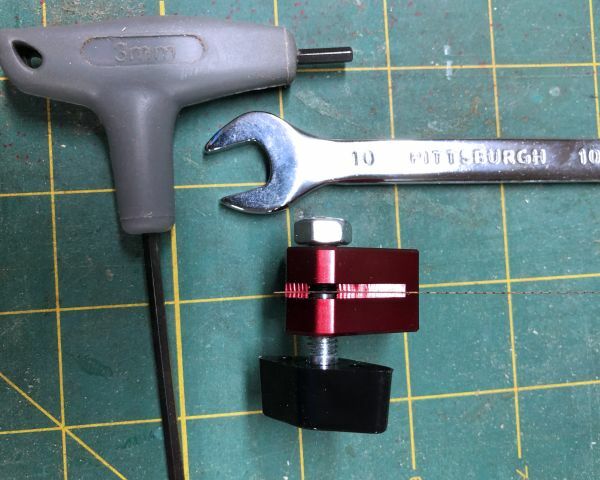 They also say that these clamps are easier to use than the standard clamps. You can read my earlier review at this link to see my conclusion of these claims. To save you some reading I basically say I can't prove all their claims but what they say sounds reasonable. 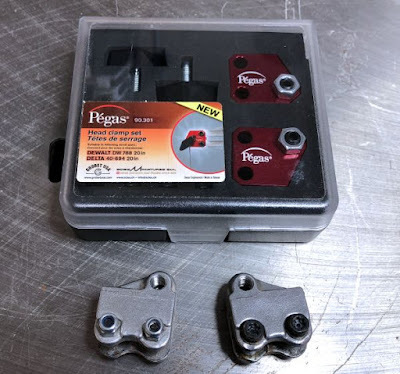 The Pegas clamps are available for Pre-Order at Bear Woods. They sell for $64. At the time of this post the graphic for the DeWalt version on the Bear Woods site is incorrect. They still show the Excalibur version so don't let that confuse you. 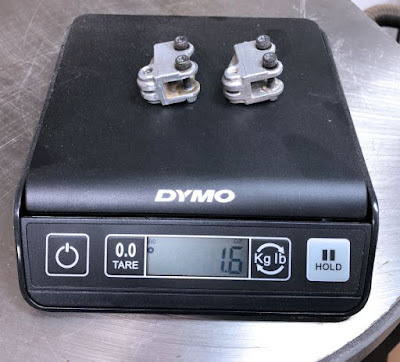 The original DeWalt clamps weigh 1.6 oz. 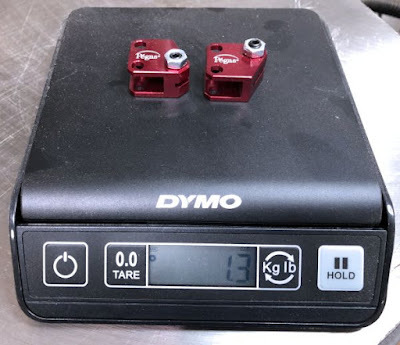 The new replacement Pegas clamps weigh 1.3 oz. The set screw did not come adjusted. You will need a 10mm wrench and a 3mm allen wrench to make the adjustment. Just center the blade in the clamp. You will need a 3mm allen wrench and a 7mm wrench to install the new heads. The hardware on the original DeWalt clamps is different so you will need a 1/4" wrench and a star bit to remove the hold clamps. The new Pegas set comes with the head, set screw, thumb screw and replacement sleeves. There is a top and bottom clamp. You can install them backward and upside down. The picture above shows the correct orientation. If you get them backward you will not be able to install the blade. Don't ask me how I know this. 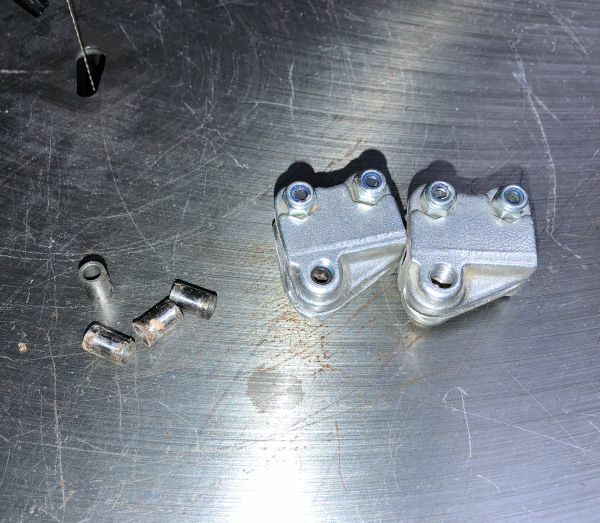 Here are the original DeWalt clamps. The sleeves on the left were also replaced. The new ones are different so save these and the old clamps in case you ever want to put them back on the saw. The whole job is simple and only take a few minutes. In this next photo, you see the DeWalt with the Excalibur style of these Pegas clamps installed. You will notice that it has the tension lever on the head. Theis causes you to have two tension levers. I have had a couple people tell me they actually prefer having both levers. 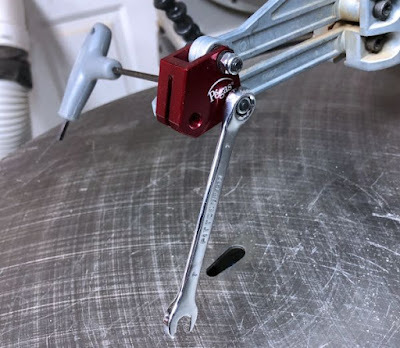 They use the standard lever for rough tension then just use the flip lever for quick tension. My opinion of this is not well formed yet. I think I prefer using the DeWalt version of the Pegas heads but at least you have an option. There is a scenario where I think these new heads are a really a good buy. 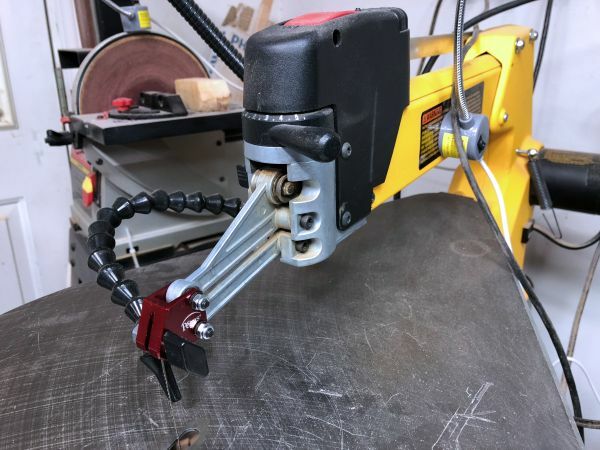 It is very common for the standard DeWalt clamps to get bend from over torquing the thumb screw. They then will not hold a blade effectively. The blade will slip out of the clamps and drive you crazy. The thumb screws are also wear items that need to be replaced occasionally. If you need these items replaced I would order the Pegas replacement set for sure. The parts cost of the standard parts is around $56 and this new "better" set is only $64. I think that would be a smart buy.